The old ration cards are automatically converted into the Tamil Nadu ration cards by the Tamil Nadu State Government. The existing ration card holders will receive a PIN on their registered mobile number and they can collect their Tamil Nadu smart ration cards from the nearest TNEPDS center just by showing the SMS. The State Government has launched Tamil Nadu PDS Smart Ration Card Scheme in order to take the simple Ration Cards to the next level. Below is the step by step procedure for correcting the Tamil Nadu Ration Card details online for TNEPDS Ration Card/ Family Card in Tamil Nadu. click on the “Beneficiary Login” which is located at the top right side of the website. After clicking on this link, you will be redirected to the login page. After you are redirected to the login page, enter the registered mobile number and an OTP is sent to the registered number. Provide the OTP and login to your account. Click on the “Smart Card Details Edit” on the left-hand side. Check all the details that were correct. If any of the details are wrong, click on the edit option and change the details. If there is any requirement of the documents, upload the documents wherever it is required. After doing all corrections and updates and submission of the form. An acknowledgement number appears. Click on the acknowledegement to accept the corrections and click on the “Submit for approval”. After the complete submission of the corrections, you are provided with a reference number which will help you to track down the application status. 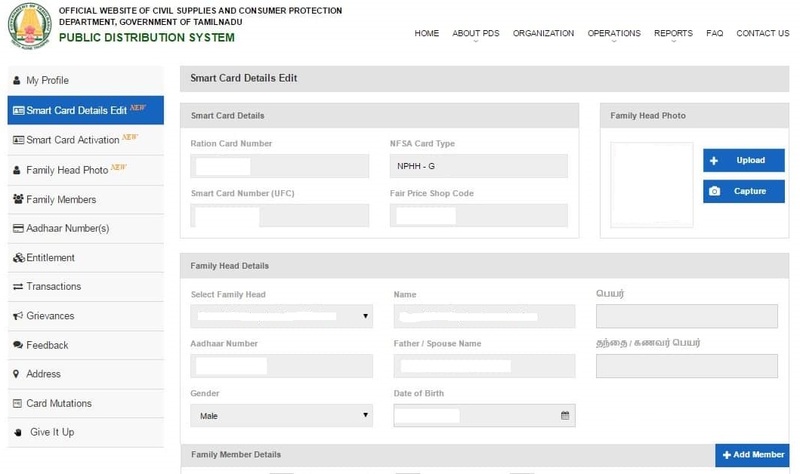 Apply Online for TNPDS Smart Ration Card & Track Application Status Online. Link your Aadhaar Card with the TNPDS Ration Card using TNePDS App.